For a mobile enthusiastic 11 April is the day to remember for me. Because this is the day of Samsung Galaxy S5 release all over the world. And my home country Bangladesh is no different. Actually Samsung unveiled the phone yesterday with a grand launching ceremony. The device is price 60,000 taka ($770) only! Yes I said only, because the previous 2 flagships were both launched with 69,900 taka ($900) price tag. So it’s wonderful news if you want to buy this premium 2014 device by Samsung. The device with a 2.1 GHz Octa core processor will also be available at 12 equal monthly installments. Samsung is also offering free S View cover with every S5 purchase. The device boasts a finger scanner for security and long term evolution access, which is a far faster wireless technology compared to 3G. The handset was officially launched at Ruposhi Bangla Hotel in Dhaka yesterday in exclusive association with mobile operator Robi, the third largest operator with 25.7 million subscriptions. Robi customers will get some special benefits for six months, such as 500 megabytes of free internet surfing, missed call alert, breaking news, and sports news. Don’t assume that Robi is the only operator to offer Galaxy S5. All other mobile phone operators like Grameenphone, Airtel and Banglalink also has Galaxy S5 on their bag too. The device comes in four colors -- charcoal black, shimmery white, electric blue and copper gold. 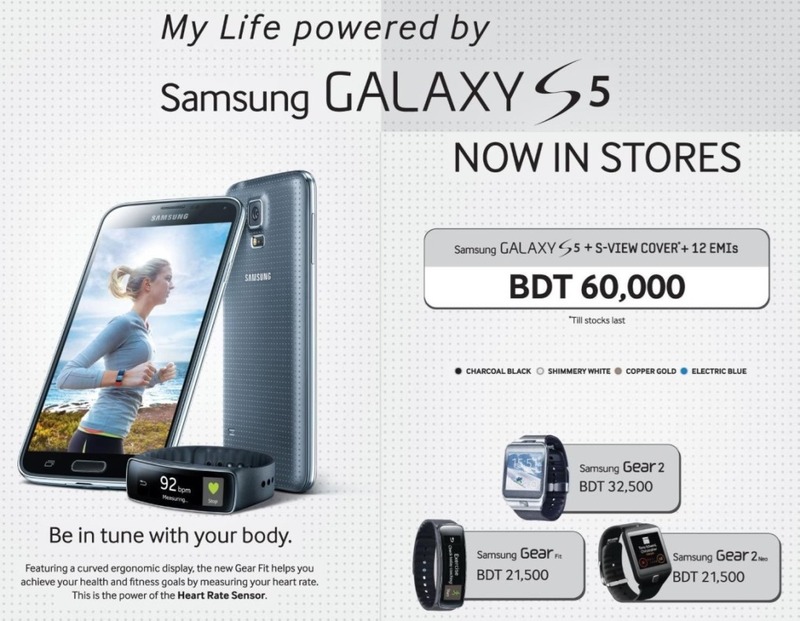 Along with Galaxy S5 release, Samsung also release all three Gear smartwatches in the market. But the pricing seems way too far of the international market. Samsung priced The Gear 2 at 32,500 taka ($420), Gear 2 Neo and Gear Fit at 21,500 taka ($275). The price was excellent at the pre-order period. Samsung has offered Gear Fit at the rate of only 10,000 taka ($130), when it was ordered along with Galaxy S5. But we hope Samsung will surely lower the prices very soon.